July 1904: first stage appearance, at the Tôkyôza, where he receives the name of Nakamura Kotarô II. April 1916: Nakamura Kotarô II takes the name of Nakamura Fukusuke V at the Kabukiza. February 1917: Fukusuke plays at the Minamiza the role of Shizuka Gozen in the michiyuki "Yoshinoyama"; the role of Tadanobu is played by Ichimura Uzaemon XV. February 1918: Fukusuke plays at the Kabukiza the role of Irie Tanzô in the drama "Yoshitsune Senbon Zakura". March 1920: Fukusuke plays at the Minamiza the role of Matsushima in the drama "Meiboku Sendai Hagi". 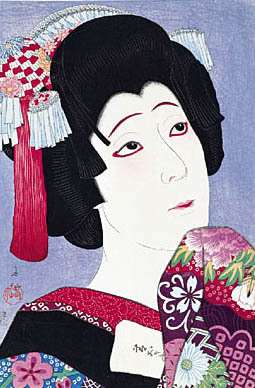 April 1920: Fukusuke plays at the Kabukiza the role of Matsushima in the drama "Meiboku Sendai Hagi". March 1921: Fukusuke plays at the Yokohama Gekijô the role of Matsushima in the drama "Meiboku Sendai Hagi". October 1921: Fukusuke plays at the Kabukiza the role of Konami in the 9th act of "Kanadehon Chûshingura"; the role of Konami's mother Tonase is played by Fukusuke's father Nakamura Utaemon V.
February 1922 ~ April 1924: Fukusuke is the leader of the Hagoromokai, a society dedicated to the study and the development of shosagoto. February 1922: revival at the Imperial Theater of the Nagauta-based dance-drama "Tsuki no Kao Monaka no Natorigusa", which is entitled "Oniji Hyôshimai"; Fukusuke plays the role of Matsu-no-Mae [more details]. September 1922: Fukusuke plays at the Shintomiza the role of Chidori in the drama "Heike Nyogo no Shima". March 1923: Fukusuke plays at the Imperial Theater the leading role of the dance "Onna to Kage" ("The woman and the shadow"), based on a script written by Paul Claudel and a choreography made by Kineya Sakichi. October 1924: Fukusuke plays at the Hongôza the role of Konami in the 9th act of "Kanadehon Chûshingura"; the role of Konami's mother Tonase is played by Fukusuke's father Nakamura Utaemon V.
November 1924: Fukusuke plays at the Imperial Theater the role of Matsushima in the drama "Meiboku Sendai Hagi". November 1925: Fukusuke plays at the Kabukiza the role of Rikiya in the 9th act of "Kanadehon Chûshingura". July 1927: Fukusuke plays at the Hongôza the roles of Kokingo and Osato in the drama "Yoshitsune Senbon Zakura". June 1928: Fukusuke plays at the Meijiza the role of Suke-no-Tsubone in the drama "Yoshitsune Senbon Zakura". October 1928: Fukusuke plays at the Kabukiza the role of Okinoi in the drama "Meiboku Sendai Hagi". July 1929: Fukusuke plays at the Meijiza the role of Osai in the 6th act of "Kanadehon Chûshingura". January 1931: Fukusuke plays at the Tôkyô Gekijô the role of Chiyo in the "Terakoya" scene of the classic "Sugawara Denju Tenarai Kagami"; his stage partners are Onoe Kikugorô VI (Matsuômaru), Nakamura Kichiemon I (Genzô) and Onoe Taganojô III (Tonami). June 1931: Fukusuke plays at the Tôkyô Gekijô the role of Suke-no-Tsubone in the drama "Yoshitsune Senbon Zakura". July 1931: premiere in Tôkyô at the Tôkyô Gekijô of the play "Ippon Gatana Dohyô Iri", written by Hasegawa Shin, in which Kikugorô plays the role of Otsuta; the role of Môhei is played by Onoe Kikugorô VI [casting]. June 1932: premiere at the Kabukiza of Hasegawa Shin's drama "Irezumi Chôhan"; Fukusuke plays the role of Onaka [casting]. November 1932: revival at the Kabukiza of the drama "Gedatsu", a play belonging to the Kabuki Jûhachiban; Fukusuke plays the role of Kagekiyo's daughter Hitomaru [more details]. March 1933: Fukusuke appears on stage for the last time, playing at the Kabukiza the roles of Satsuki, Motome and Okuma in the dramas "Toki-ha Ima Kikyô no Hataage", "Imoseyama Onna Teikin" (the "Mikasayama Goten" scene) and "Tsuyu Kosode Mukashi Hachijô". Nakamura Fukusuke V was a talented onnagata actor, who unfortunately died too young. He could have been Nakamura Utaemon VI but he met with a tragic and early end.